Turn your iPod or iPhone into a high-end audio system. Digital Music Data Converter for iPod/iPhone/iPad. Fully compatible with 30P Dock connector equipped iPod/iPhone. Fully compatible with Brand New Lightnig connector equipped iPod touch 5th, iPod mini 7th, iPhone 5, iPad 4th. and iPad mini. Just hook up with Apple Lightning – USB cable or 30P dock connector –USB cable. S/PDIF Digital Audio Output, Coaxtial and Toslink/Optical for Audio System. Two independent X-tal Audio Master Clock oscillators (22.576MHz and 22.5792MHz) generate precise S/PDIF Digital Audio output signal. Low ripple and spike noise powerful AC adapter provides enough power to charge iPod/iPhone/iPad(2nd or newer). Ready for Apple Remote, provides same function as iPod Universal Dock. Elegant design matches to High-Fidelity Audio System. Fully Digital, noise free and lossless processing. RAL-1648iP1 receives Digital Music Stream from iPod through USB cable, and converts it to S/PDIF Digital Audio Stream for external DAC System. The Digital Music Stream is processed with 32bits Multi Thread Processer based RAL Digital Audio Technology and precise Audio Master Clock and converted to jitter free S/PDIF digital audio stream. Makes it possible for iPod/iPhone/iPad works as a quality audio music server. All music files cam be playback on iPod can be passed to DACs through RAL-1648iP1. It allows playing back noise free digital music, and provides smart and user friendly digital Audio System. Pure Digital to Digital conversion. RAL-1648iP1 accesses iPod, gets Digital Audio Stream bypassed internal DAC / Analog audio circuit inside iPod and converts the stream to standard S/PDIF Digital Audio Output. 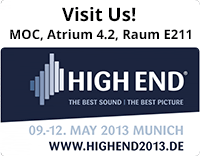 High grade components and circuit for Quality Audio. RAL-1648iP1 has two independent X-Tal oscillator modules (22.5792MHz and 24.576MHz) to generate Audio Master Clock. The Advanced clock circuit and 4-layer computer grade circuit board produce a bit-perfect and low jitter digital audio output for DACs or A/V audio systems. 32bit Parallel Processing RISC MPU with multithreading software procides accurate S/PDIF Audio Stream putput to DACs. Simple and easy connection with iPod/iPhone/iPad. Just hook up iPod and RAL-1648iP1 with Apple Dock Connector USB cable. iPod abd RAL-1648iP1 start communication, charging (except iPad) and recognize each other. Run iPod application same as usual, listen high quality music with your favorite Quality Audio system. High grade two digital output, Coaxial and Optical. Fully electrically isolated Coaxial output (75ohm,unbalance) and wide band width range TOSLINK transmitter are equipped. Compatible with Apple Remote controller. 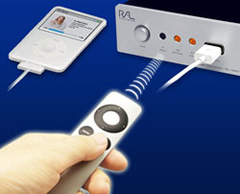 RAL-1648iP1 has a IR remote control signal receiver and fully compatible with Apple Remote Controller (not included in the box, sold separately by Apple.) allows same remote control function as Apple Universal Dock below. - Menu and Volume up,down buttons are not supported. Universal Dock also dose not support these buttons. iPhone, iPod Classic, iPod Nano and iPod Touch are registered trademarks of Apple Inc. in the United States of America and other countries.